Treats for Baby Tuesday: Wallmart PictureMe Portrait Studio, Old Navy + More! Save $10/$50 or more with this Old Navy printable coupon. Bring this Carter’s printable coupon to your nearest store and save 20%/$50 or more! 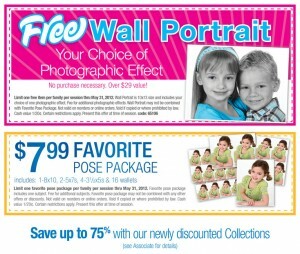 Get a FREE Walmart’s PictureMe Wall Portrait and a 23-print photo package for $7.99! These Babies R Us printable coupons will save you money on diapers, diaper bags, outdoor toys and more! Plus, these Babies R Us and Toys R Us printable coupons and deals are offering an extra 50% off clearance clothing and shoes plus deals on Carters, KoalaKids, sunglasses and flip flops. Jumbo packs of CVS-brand Diapers and Training Pants are $6.99 ea. B1G$2 in Extracare Bucks at checkout. That’s $4.99 per pack after the ECB. CVS-brand Baby Wipes are B1G1 50% off. Super packs of Pampers Diapers are $29.99. B1G$5 in ExtraCare Bucks. Refill packs of Pampers Wipes are $5.99 ea. 320 ct. pks. of Pampers Wipes are $9.99. B1G$2 in +UP Rewards at checkout. Jumbo packs of Pampers Diapers, Overnights and Training Pants are $9.99 ea. B1G$2 in +UP Rewards. Jumbo packs of Walgreens-brand Diapers, Training Pants or Overnights are B1G1 50% off. Soft packs of Walgreens Wipes are B1G1 50% off. 23-25 oz. cans of Walgreens-brand Infant Formula are buy 1, get B1G1 50% off. Big packs of Huggies Little Movers and/or Snug and Dry Diapers are $19.99 ea. Select big packs of Huggies Diapers are $19.79 ea. + you’ll get a FREE 56-64 ct. pk. of Huggies Baby Wipes wyb any Big Pack! Select tubs of Similac Baby Formula are $22.99 ea. Buy two of these or Pediasure SideKicks and get a FREE $5 gift card. 3-packs of Tommee Tippee Baby Bottles are $15 ea. Save on all other Tommee Tippee items, too! The Baby Brezza One-Step Baby Food Maker is $99.99 + you’ll get a FREE $20 Target gift card when you buy it! The Medela Pump In Style Advance Double Breast Pump with on-the-go tote is $250. The Fisher-Price My Little Snugabunny Rock and Play Sleeper is on sale for $49. The Baby Einstein Baby Neptune Soother is $40. The Baby Trend Jogging Stroller or the Baby Trend Flex-Loc Infant Car Seat is $80. Buy both and get a FREE $50 Target gift card. The Samsung SmartView Color Video Baby Monitor is $170.